An endless search for gluten free friendly restaurants often results in dining at some pretty eclectic eateries. Places like Lydia’s Kitchen, for example, might make you feel like part of a modern hippie movement. Her food is organic, amazingly healthy, and 100% gluten free. The quirky atmosphere in her restaurant is just part of the experience. Last weekend, I sat down for lunch at a cafe inside of a buddhist bookstore in San Rafael. The room was adorned with ornate sculptures, a small stage for enlightened guests, and ceiling high bookshelves. Patrons spoke in hushed tones, and the cafe’s speakers streamed the notes of traditional Indian instruments playing assorted Christmas tunes. 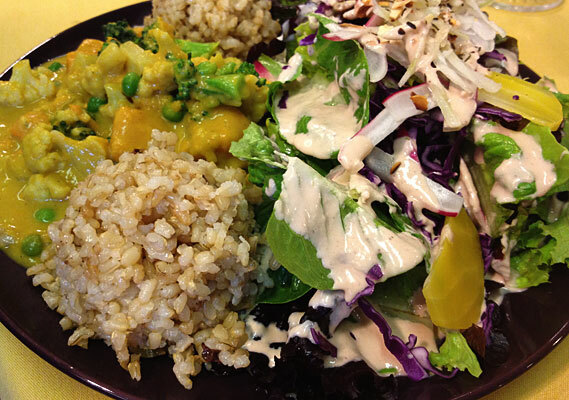 At Radiance Cafe, customers order their organic gluten free vegetarian lunch at the counter. A small but well rounded menu features items like warm lentil soup, brown rice with a homemade cashew and vegetable curry, and a spring salad covered in delicious raw dressing. This seemingly sacred yet slightly kitschy space might just serve up the tastiest and healthiest meal you’ve had all week. Hi There! Just found your blog by way of Mariposa and glad to have found you! I’m from the SF Bay Area originally, so I make it down there a fair amount to visit – looking forward to using your site as a resource to find great places to eat!